We have created a number of forms that will help get your enquiry to the right place. If you would rather write or speak to us please use the details in the menu to the left. Use the forms in this section to let us know how we are doing or to make enquiries about our organisation. We love to hear about something we have done well, and work hard to maintain a high level of service. If you are planning an event that we should know about in case there is an emergency, please call us on 0117 926 2061 and speak to our control centre. Please do not submit a form as we may not be made aware of your plans in time. Let us know about any safety concerns you may have by using the following forms. We take all concerns seriously and have a friendly and professional team ready to help. Here you can find any forms relating to business activity. 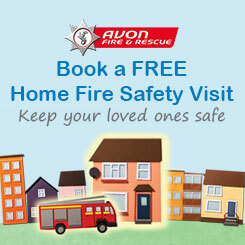 Use this section if you are a supplier, looking to be a supplier to Avon Fire & Rescue Service, or if you need advice on how to keep your business compliant with fire safety law. Providing us with your personal information will enable us to respond to your enquiry or provide details of products and services that you have requested. By providing us with your information, you consent to us processing it for this purpose. Please refer to our Privacy Statement for further information about how we use personal data and the conditions in which we may share it. Candles cause more than five fires a day.